The decision to become involved in Thoroughbred racehorse ownership is very exciting. It can open up a whole new world to you and your family and friends. Over the next several months, I’ll be posting a series of blogs with common questions I get from prospective owners. I hope you enjoy the series. Feel free to leave a comment or question below or shoot me an email at terry@westpointtb.com. 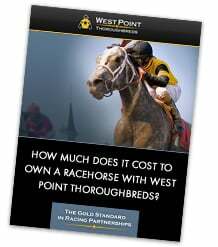 What are the pros and cons of owning a racehorse in a partnership? Our COO, Tom Bellhouse, blogs about the pros and cons of owning a Thoroughbred racehorse in a partnership. I’d say the number 1 pro is diversification — you can spread your money across multiple horses, increasing your chances of owning the “home run” horse. Number 1 con for people is limited control. I’ve been on your website, I’m interested in learning more, what’s the next step? Don’t be afraid to reach out to us! 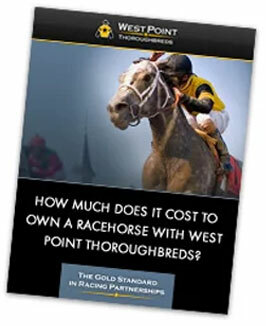 If you’re interested in becoming a Thoroughbred racehorse owner, whether it’s now, a year from now, or further down the line, we’re here to answer your questions. Reach out to debbie@westpointtb.com and we’ll be happy to schedule a teleconference with one of our team members. There’s no pressure. We encourage you to do your homework and ask any partnership you’re dealing with the tough questions. We’re not for everyone, but we pride ourselves in transparency, integrity, and excellent customer service. Why do you charge a markup? As I discuss in this blog post, there’s value in sitting back, and enjoying the experience of watching your horse compete without worrying about extensive operational details. You benefit from dealing with experts in the industry with vast institutional knowledge and proven racetrack performance. I want to do this, but my spouse is reluctant. Do you have any advice? Click here to read a post about how racing brought Partner Fred O’Dell and his family together. The beautiful part about racing is that every member of your family and be involved and have fun with it. Bring your reluctant significant other out for a magical morning on the backside, and I think you’ll both be be surprised. Click here to view all of our blog posts. I welcome your comment and thoughts.